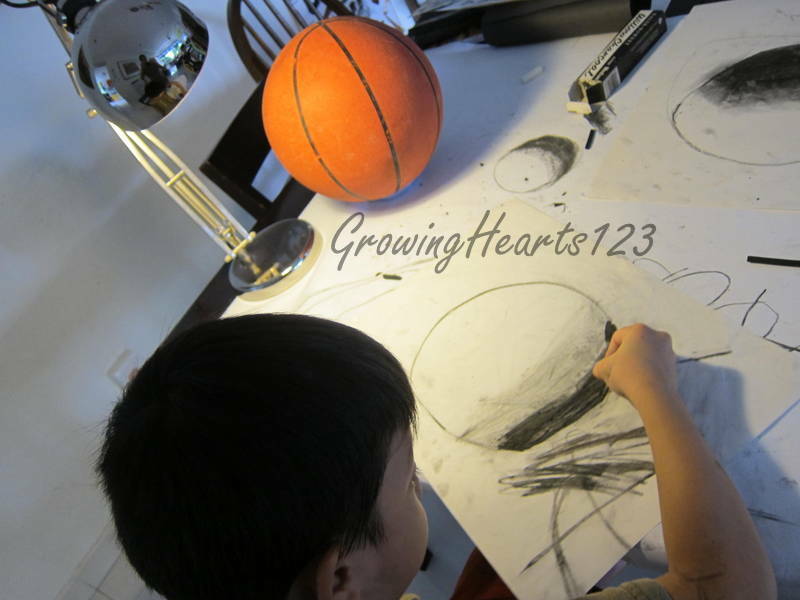 For the longest time, I’ve been wanting to do more ‘formal’ art lessons with the kids. Formal in the sense, where I plan the series of lessons and make it a priority in my home education. 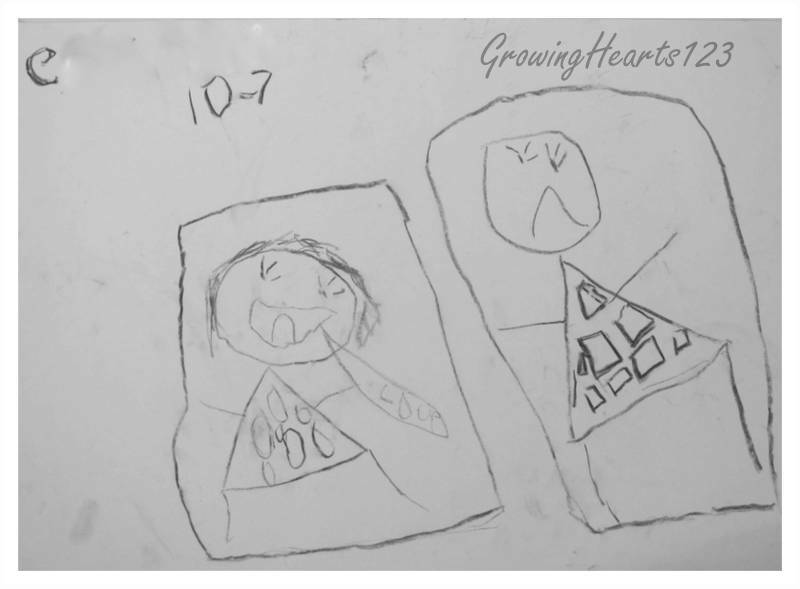 According to my observation, A had lost his desire to create and even doodle ever since he entered Primary 1 (unlike the past he brings home his doodles daily from school). 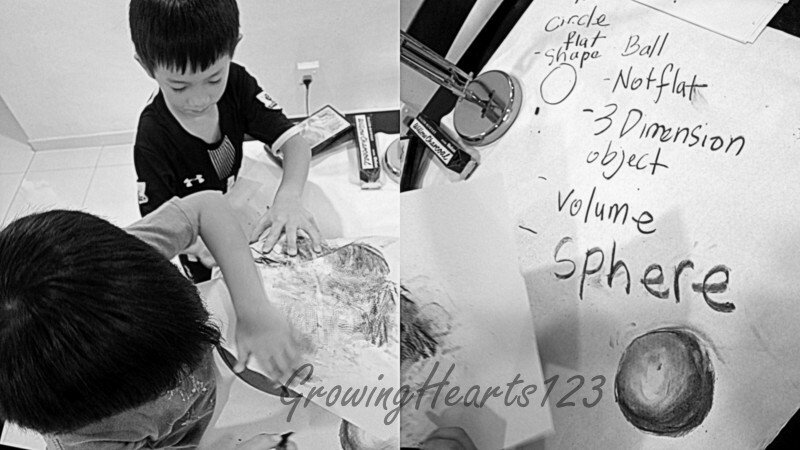 In contrast, J and E started to blossom in their Create initiatives this year. Instead of lamenting, I decided to include Art into A’s homework time once a week to hopefully rekindle his interest in art. Am I glad to finally kick-start my first Art lesson last Friday! I hope to have such Art lessons on a weekly basis. Each topic will take about 3 to 5 sessions depending on the depth of interest. 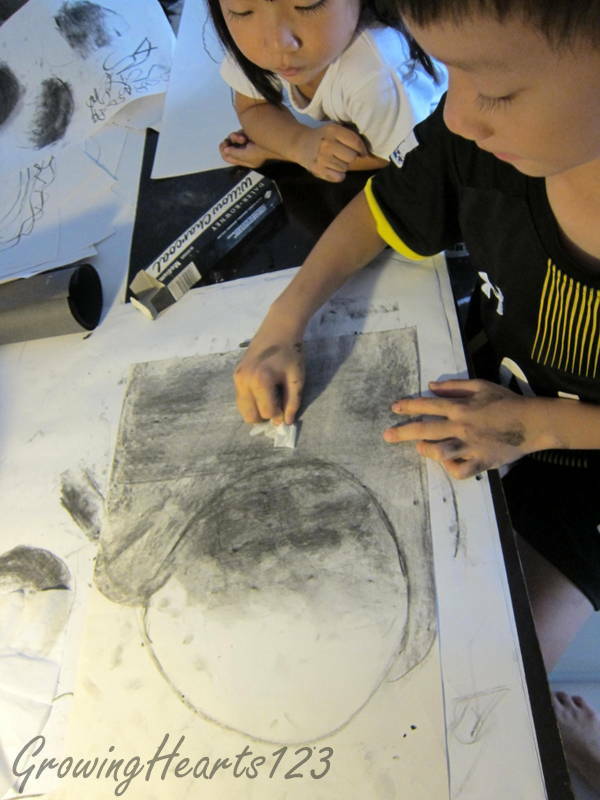 Many feel helpless when it comes to teaching art. I hope that my lessons can inspire, provide practical ideas and offer a better understanding on how art can be nurtured at home. 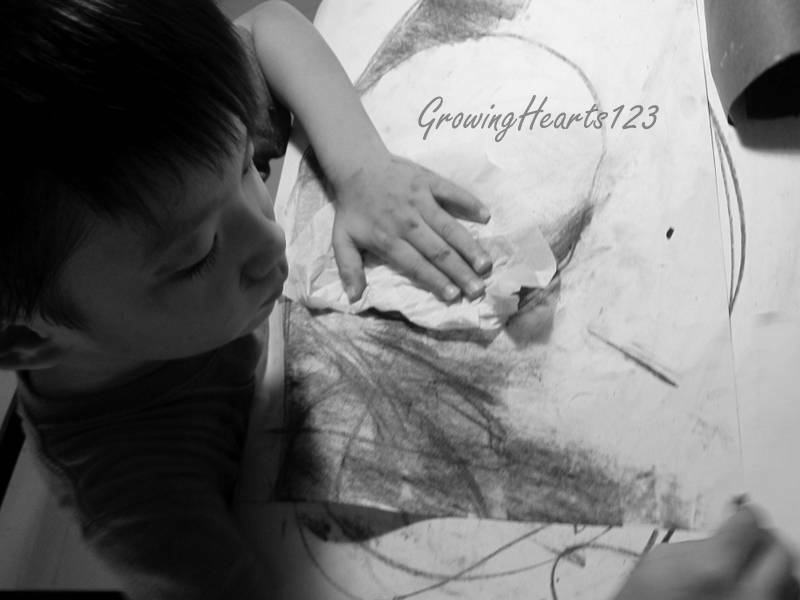 I am a firm believer of First Hand Observation drawing whenever possible. 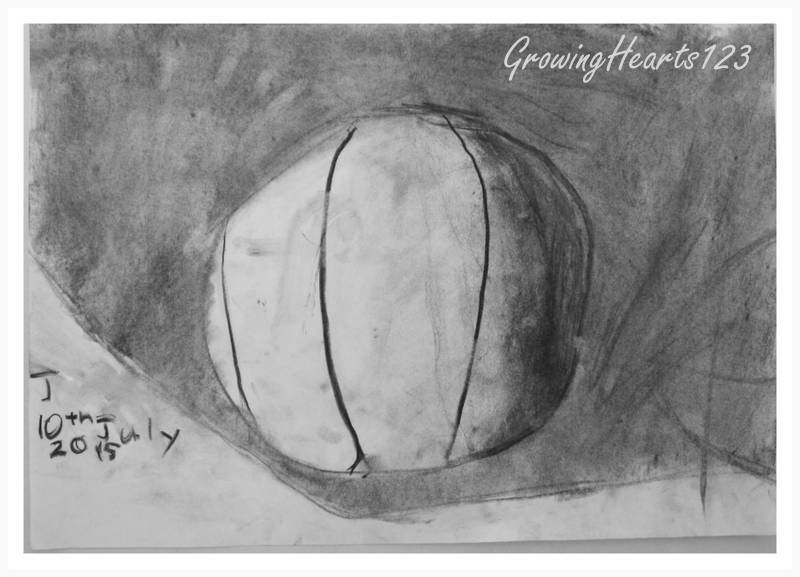 Basically, it involves looking at real life objects/scenes to draw as opposed to using a small photograph or learning to draw through copying of someone’s work. More explanation here. 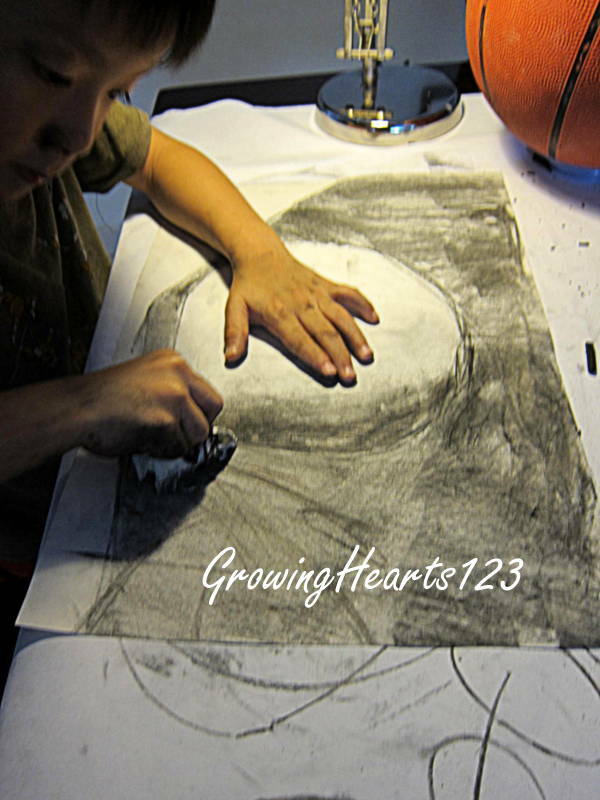 I had discussed with A on what he would be interested in drawing and exploring for art. Papa had introduced the Japanese anime cartoon on Slam Dunk to the boys. We were hooked! Then he borrowed the Chinese comic series and they’ve been devouring daily the episodes. 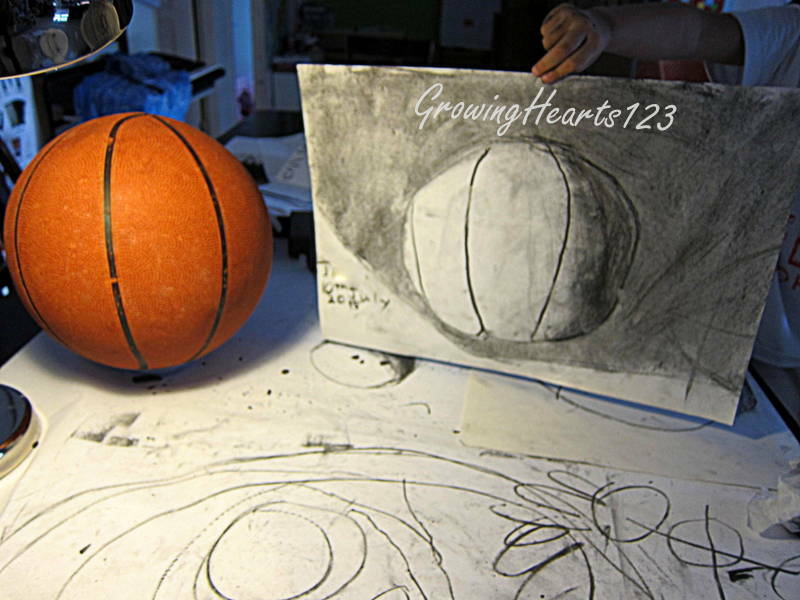 For beginners, I introduced the basketball as their still life object to observe and draw. In order to see clearly the light and dark of the object, I did the set up below. We discussed on the shape of the ball. They exclaimed ‘circle’. “Is the ball flat?” They shook their heads and tried describing- fat, round, can hug! I smiled and added it takes up space. At this point, I introduced the term- Volume. The air inside the basketball is wrapped up by this piece of rubber which makes it three Dimensional having a volume. This is unlike the shape of a circle which is flat (2Dimensional) For this volume which is round like a circle, it is called a SPHERE. 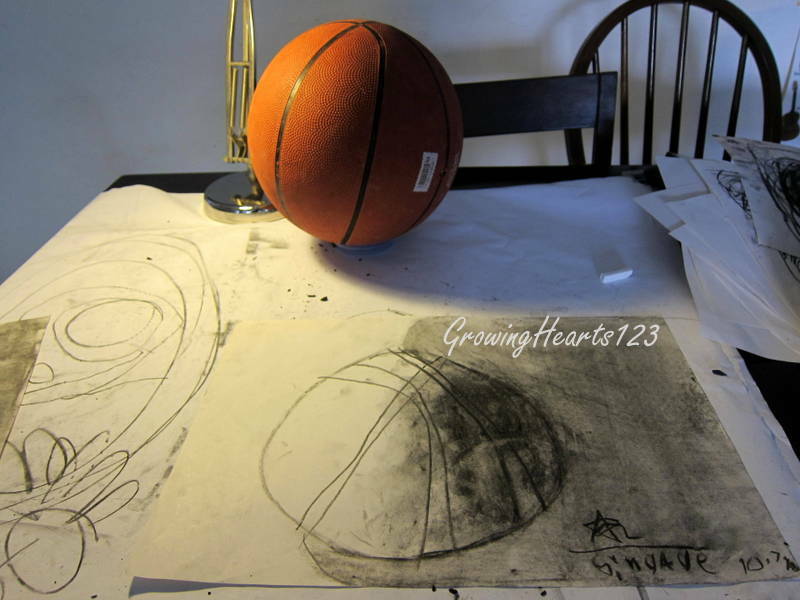 After the theory, they used charcoal sticks to rub on the paper which is pressed onto the ball’s surface creating its spotted texture. Again, I asked what kind of texture did they make, smooth/rough? 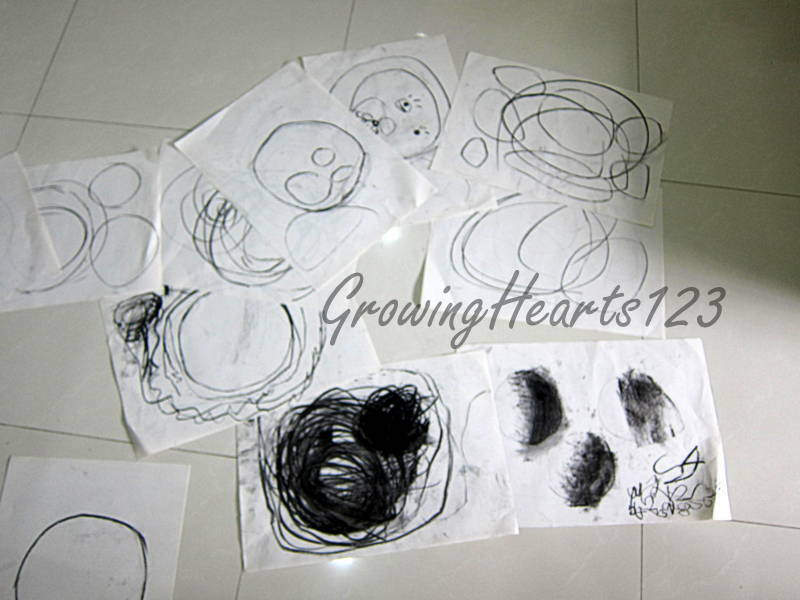 Next, they had a hand in practising drawing a circle on their A3 sized papers. 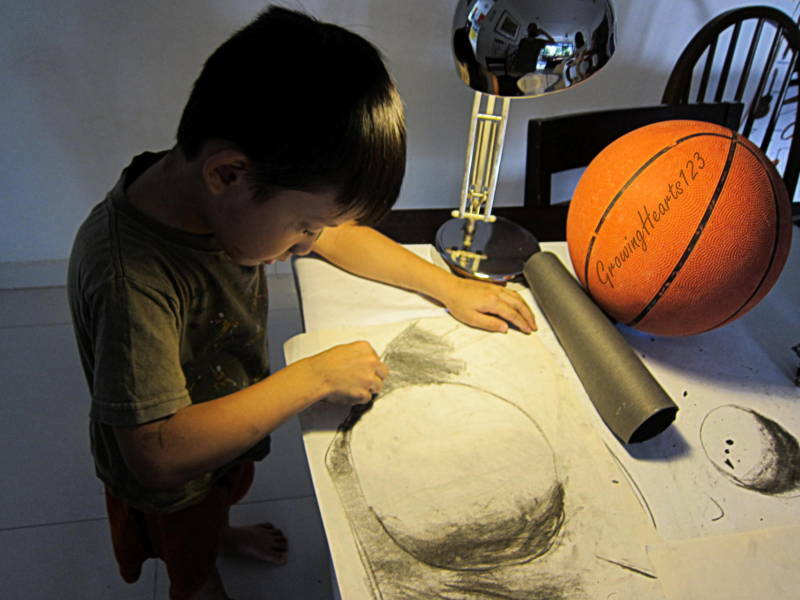 They had imagine it to be easy peasy until they started drawing… It took many tries before they could do a decent one. I did not record the process down this time. I hope to do so for the other observation lessons. 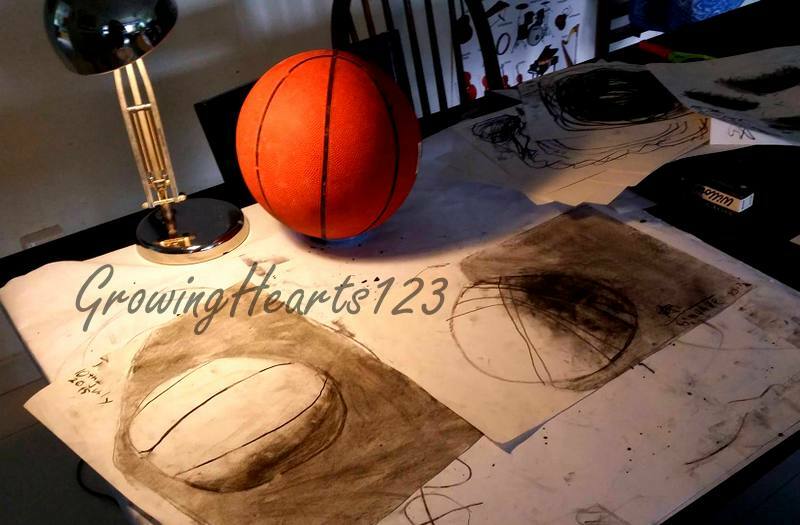 I had demonstrated how to shade a circle using charcoal stick. 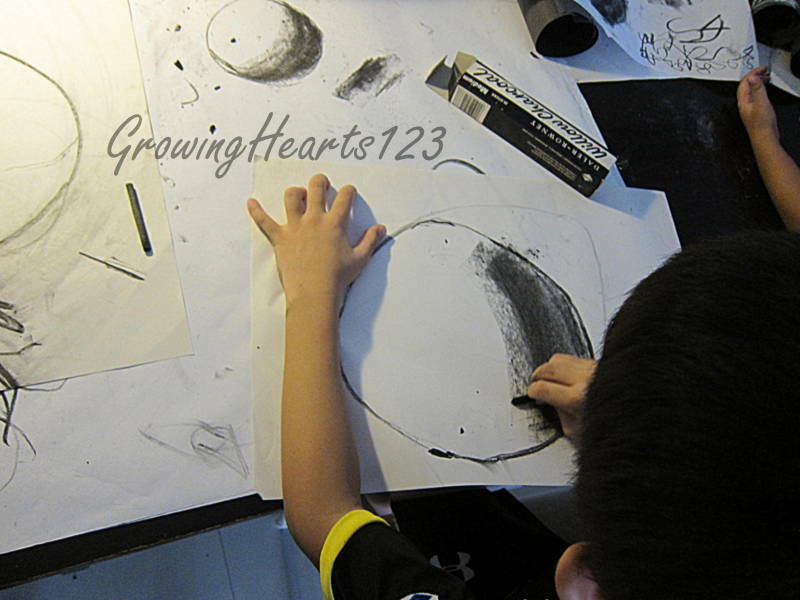 They then practised shading in circles that I had drawn before attempting on their own circle. 6) Observation of the Cast of Light. If you noticed, A did not ‘copy’ my sample shading. He was paying close attention to the still life object and observing the cast of light by himself. A then made his own judgement on the shadow and shaded the areas. After which I taught him to carefully use a tissue paper to smudge evenly the shadow background to show the difference between the object and the shadow. He also made his own call on the black lines on the ball. I quizzed him on the double lines and realised they were the outlines of each black line. Different from A, J had used one clean bold stroke to portray the curved lines. He was also sharp in detecting the slant at the bottom of the ball. E was contented to doodle her own. I was delighted with her nice circular head! This process was not without issues. 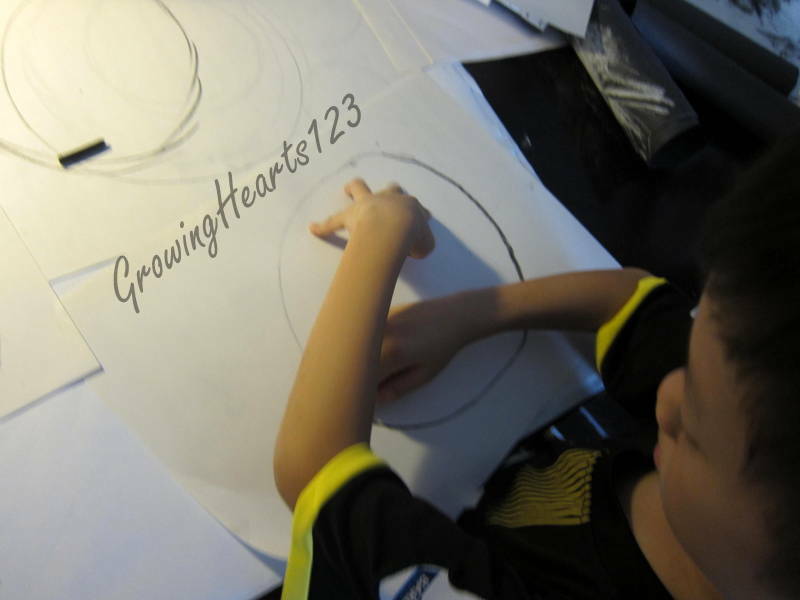 I had to manage the boys’ expectations as they had mistakenly imagine drawing circles to be simple. 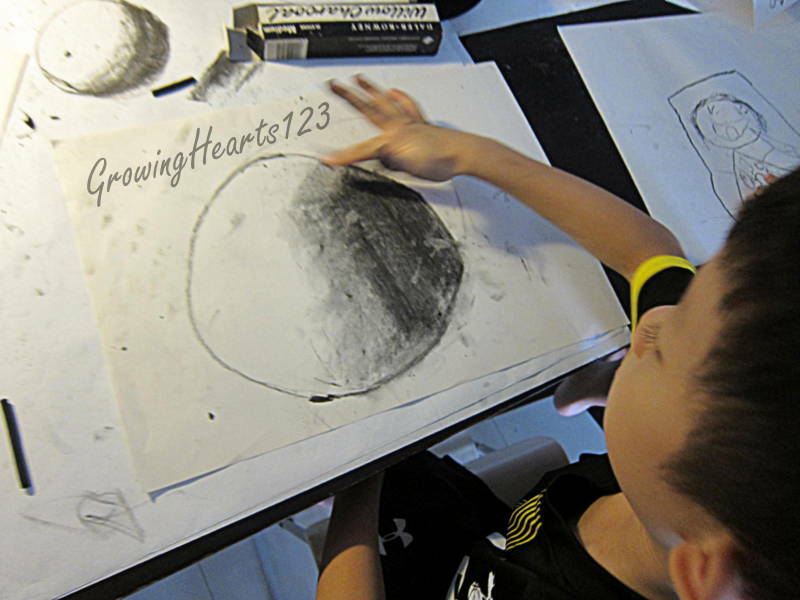 It was after much encouragement and coaching that they finally pressed on in learning how to draw. Shading was surprisingly smoother as they caught on quickly my technique. 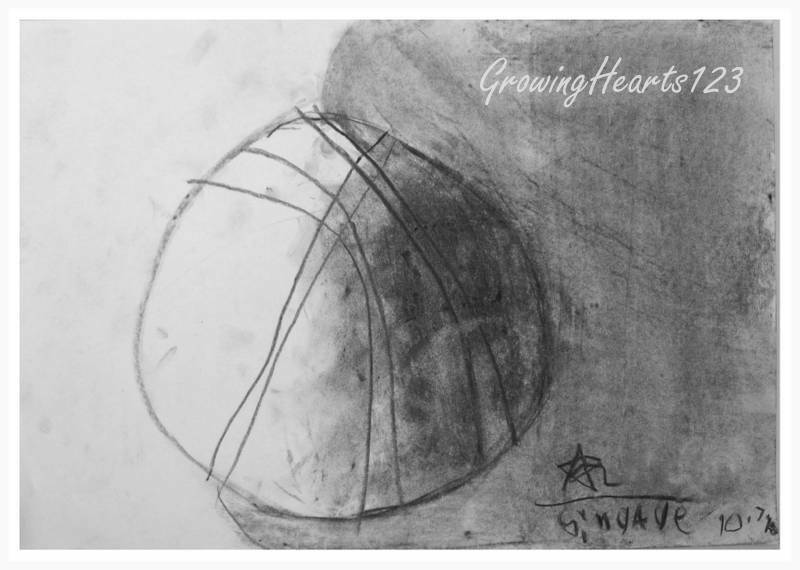 Tips: I started this Observation drawing with Charcoal Sticks as the stick is easier to manipulate and shade a bigger surface area with less effort (compared to using a pencil). I also asked them to draw on an A3 sized paper instead of A4. 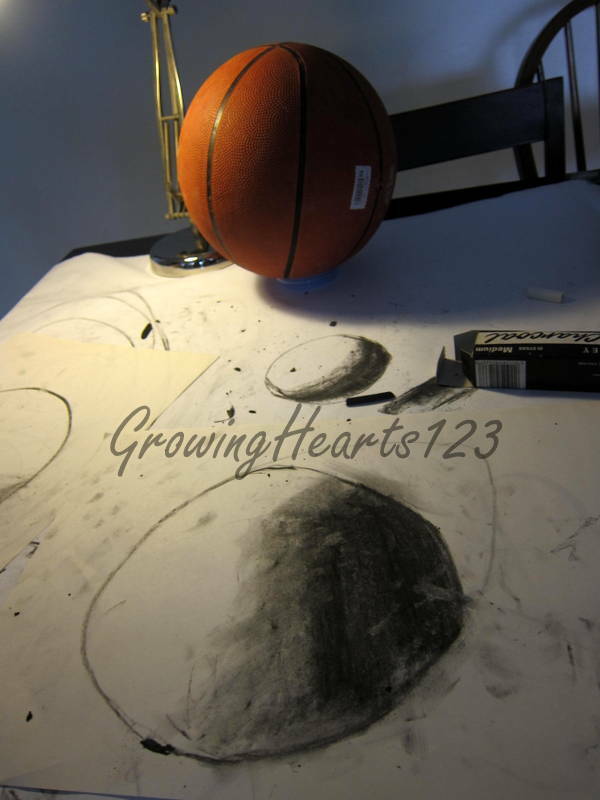 By drawing the circle close to the size of the ball, it gives the boys a better gauge on the scale and areas to shade. On the whole, I am very encouraged and elated to see how much we have accomplished in this lesson. Looking forward to the next session! Do note that I am sharing from my own experience as an Art Teacher. There are many other methods and ideologies out there. I’d be happy to learn from you too! 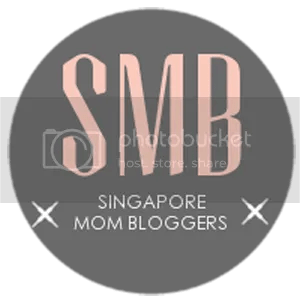 If you like this post and you’re interested in following my series, do stay tuned for the Art and Movement Painting session! Do share this post if you know of others who would be keen to join us! Do you have any questions/ queries? I’d be happy to reply to the best of my abilities. Previous Wonderwoman!Superman! Me? Hubs 2? Maybe You 3? Next Bye Penang! Hi Batu Caves, Twins and Malacca!